Click to buy Woad dye, soda ash & Dithionite! Follow the usual precautions of wearing rubber gloves, and a face mask when handling chemicals. 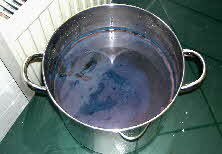 Keep the saucepans, jugs, spoons or any other utensils just for dyeing and do not use them for food preparation. 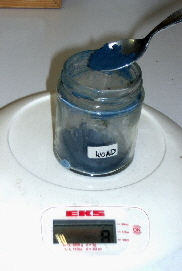 It is better to weigh the woad, soda ash and Dithionite in labelled jam jars rather than on the scales bowl. The jam jars can be used again and again. The woad powder is very fine, and somewhat difficult to clean from the scales or bowl. Make sure the Dithionite is not too old. The literature says that 10 grams of woad should dye about 1 lb (454 gram) of silk, cotton or linen to a medium blue and that the shade will be darker on wool. 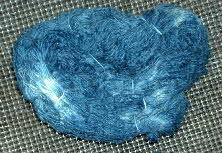 However, in my experience 10 grams of woad dyes only 200 grams of fibre (i.e. 0.5 lb) to a medium blue. 1. Soak fibre overnight or for at least two hours. This opens up the fibres, increasing dye penetration. 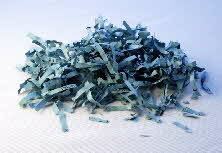 It also removes as much oxygen as possible and helps to prevent the fibre floating to the top of vat. 2. Place a jam jar marked ‘soda ash’ on the scales, zero the scales and weigh the soda ash in the jam jar. Pour 300 ml of very hot water (about 80°C) in a Pyrex jug. Add soda ash to water, stirring well to dissolve it. Allow to cool slightly. 3. Place another jam jar marked ‘woad’ on the scales, then zero the scales and weigh the woad. Make sure there are no draughts whilst you do this as the woad powder is very fine and can blow everywhere. Add 30 ml warm water (no more than 50°C) to the jam jar, a little at a time, to make a smooth paste. Gradually add the paste to the soda ash solution, stirring slowly. Leave for 30 min. This woad solution can be kept for a few weeks. 4. Pour about 2 ½ litres of boiling water into a stainless steel saucepan or stock pot. Add enough cold water (between 1 and 2 litres) to bring the temperature down to 50°C. 5. Lower the woad solution into the water, tilting the jug so that water enters the jug and the contents then flow smoothly into the saucepan. Do not pour from the jug whilst it is held above the saucepan. Measure the pH, it should be at least 9 or slightly higher, but not higher than 10. 6. Sprinkle 20 grams of Dithionite onto the surface of the woad vat. Keep the temperature constant at 50°C. This can be achieved by keeping the saucepan near a radiator, in a basin with hot water, or by wrapping it with blankets. Leave for an hour to an hour and a half. The solution should be a yellow-green colour with a bloom of bronze bubbles on top. If this does not happen, check that the pH is still between 9 and 10 and add another 2g of dithionite keep the vat warm and wait for another hour. 7. Warm the fibre in water at a similar temperature to the woad vat. Wearing rubber gloves, squeeze the fibre while still in the soak water, keep it squeezed (compression helps to keep the air out) as you let the excess drip over the soak water. 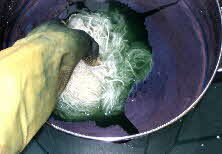 Lower the fibre into the dye vat and then release. Leave for 10 min. 8. Remove fabric and expose to the air for 15 min. Rinse, dipping the fabric for 1 min and expose for 15 min. Repeat a few times. Leave to air for a couple of hours. Rinse well. 9. You can exhaust the vat by putting an old cotton cloth overnight. On the next day, remove the cloth and whisk the vat well. Dispose in the toilet.